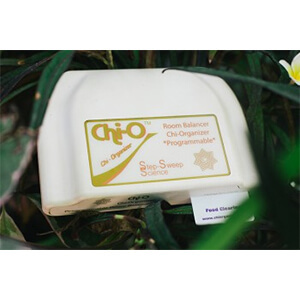 With the Chi-O Room Balancer you can positively influence the feeling of well-being in space. You do this by simply putting a pre-programmed hologram card in the device. Of course, the Chi-O Room Balancer has the same bio-friendly frequencies as the smaller Chi-O models such as the Chi-O Economy. But this device is much more powerful. Additional amplifiers have been added and as a result the scope covers about 92 square meters. The device is powered by a small rechargeable battery (once charging takes a maximum of 6 months). That is why you can easily take it to work or when you travel. This allows you to improve your living environment while you are at work or somewhere else. In addition to the bio-friendly frequencies, you can also code the signal with specific information fields. This allows you to achieve specific effects. 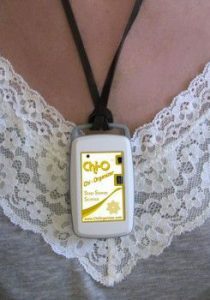 Two pre-programmed hologram cards are included with the purchase of the Chi-O Room Balancer. These are: Chakra Balance and Eliminate Negative Energy. All holograms are programmed with IDFs (intrinsic data fields) and do NOT work on a physical level as such. They are designed to re-inform the biofuel system of information that has been forgotten or removed by the system (in case of trauma) or has been disturbed by foreign substances (chemicals and toxins). The physical body knows how to heal itself if it has the right instructions. All physical changes that are observed through the use of these Holograms come from the healing of the body itself. All experiences with the use of the holograms and seeing associated results in the physical body are accidental and should not be misinterpreted as treatment of a disease or medical condition. Contact your authorized healthcare professional for any medical conditions before using these products. Not intended for the diagnosis or cure of medical conditions. The word “programmed” means that we have encoded the hologram with certain IDF resonant patterns. This work must be considered experimental and the manufacturer or vendor does not offer any claim to use or effectiveness.